Populism lives by the thought that the presence of the people in government is sufficient to wrest control from an unrepresentative elite. 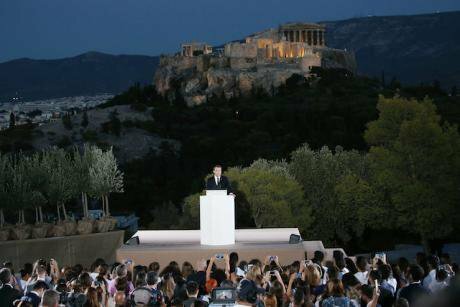 French President Emmanuel Macron delivers a speech at the Pnyx hill beneath the Acropolis of Athens, Greece on September 7, 2017. NurPhoto/Press Association. All rights reserved. Shortly after he became president of France, Emmanuel Macron visited Greece, where he addressed an audience in Athens. In an assured performance he surprised everyone by beginning his speech in Greek, before switching to French. Against the night sky, the Parthenon behind him and a young crowd in front of him, the place from which Macron spoke was well chosen. It was the Pnyx. The Pnyx is the hill on which the assembly (ekklēsia) of citizens in ancient Athens met to debate and decide on their common affairs. The symbolism was obvious. After the years in which Greece’s modern-day democracy had been subject to the harsh disciplines of the European monetary order, Macron’s presidency represented a new beginning for Europe, a new beginning that was to build on the principles of democracy. Modern ambition was dignified by the image of an ancient source. Political renewal was underpinned by the memory of democratic origins, in particular by an image of democracy in which the people governed themselves directly. Democracy was to be conducted in the presence of the people. Populism lives by the thought that the presence of the people in government is sufficient to wrest control from an unrepresentative elite. The movement of protest against the banks and finance industry, Occupy Wall Street, is the clearest example of this politics of presence in physical form, with scores of Occupy movements springing up after the first occupation of Wall Street and of the nearby Zuccotti Park. The assumption is that, by taking control of the streets, one will defeat the forces of elite control. But a politics of popular presence can also take virtual form through social media, where seemingly personal encounters mimic real encounters. Why does Donald Trump tweet so much? Why do his supporters love it when he does? It is because a tweet gives the illusion of a direct relationship between leader and follower. For the follower, the tweet is addressed just to him- or herself, with no intermediary. The follower imagines a personal relationship with the president. The pretence of presence and the personalization of power go hand in hand. The pretence of presence and the personalization of power go hand in hand. Macron himself is interesting in this respect. He is commonly regarded as the politician who first started to turn the tide of populism in Europe in 2017 with his defeat of Marine Le Pen in the French presidential election. Yet Macron’s own route to victory borrowed much from the populist manual. He created a new party from scratch, drawing in people who had not been involved in party politics previously but had been active in civil society groups. The new party was to represent the people between and beyond the established parties. Its original name, En Marche, conjured up the image of a movement going forward. And, of course, the contest for the French presidency personalizes an election better than anything else. When he stood on the Pnyx, he seemed to be the reincarnation of democratic orators in ancient fifth-century Athens, who sought to persuade the citizens to make their political choices when assembled together. In doing so, he relied on Greek myths. Between 508 and 338 bce, though with several interruptions, ancient Athens practised government by the assembly of eligible citizens. Political decisions were made by those citizens gathered together in one place to discuss and take a vote on what should be done. The key institution, the assembly, consisted of the entire population of male Athenian citizens, hence all of them were entitled to attend its meetings. At the beginning of the fifth century, the assembly met ten times a year; by its end, the meetings were sometimes as many as forty. The political constitution of Athens divided the city-state into ten ‘tribes’; and each tribe was responsible for presiding over the assembly, in rotation. The agenda for debate in the meetings was drawn up by an executive body, the Council (boulē), but it could be amended. The scope of the assembly’s power was wide; it included war and peace, the currency, and customs duties. Once all those who wanted to speak had spoken, a vote was taken by a show of hands. The assembly also elected important public officials, most notably the generals, although many public offices were filled through a lottery system. In a democracy, it was said, citizens took turns at governing and being governed. Praise for direct democracy in ancient Athens has elevated this Periclean assertion down the centuries, making it echo and resound among some of the greatest political thinkers who have ever written. Virtually everyone these days accepts that assembly government of the sort carried out in ancient Athens is impractical, given the large scale of contemporary societies. Yet people still think that its model of direct democracy sets an ideal to follow today. If only we could find some way of assembling the people – or a sample of them – to get them to make political decisions, we would overcome the weaknesses of representative government. If only we could find some way of assembling the people – or a sample of them – to get them to make political decisions, we would overcome the weaknesses of representative government. There is a simple problem with this argument, however. It is not just that direct democracy cannot be practised in the modern world; it was not practised in ancient Athens either. It is well known that ancient Athens excluded women from any participation in politics; they certainly had no right of participating in the assembly. Excluded from citizenship, of course, were slaves, as were the so called ‘metics’, the resident foreign workers; and Pericles’ law of 451 bce excluded from citizenship all those whose mother and father were not, both, full citizens (a criterion that eliminated many Athenians born to aristocratic foreign mothers – such as the famous Agariste in Pericles’ own ancestry). Comparing the number of citizens to that of the total population, only between one in seven and one in five of the total were citizens. In our days a ratio like that would obviously disqualify a society as a democracy. But this is not the end of the problem. Even if we take the lower estimate of 30,000 citizens, only a fraction of them could have participated in the assembly at any one time. The Pnyx was large enough to contain only 6,000 people at a time. Government by the assembly of all citizens was literally impossible. Source Victor Ehrenberg, The Greek State, 2nd edn (London: Methuen, 1969), p. 31. Why does this matter? Athenian democracy is not all that it has been cracked up to be; and so what? After all, it was a substantial achievement at the time, and we can still find inspiration in its ideals even if their implementation was flawed. But an ideal that no one can come close to realizing ceases to be an ideal and becomes a falsehood sustaining an impossible vision. The falsehood, in this case, is to imply that there is something second best about representative democracy – which happens only because representative democracy is being judged against an idealized myth. The falsehood, in this case, is to imply that there is something second best about representative democracy. The problem is that this image is a barrier to coherent thinking about modern democracy. From the example of Athens, people take the idea that the assembled body of citizens should decide on what the government is to do and that anything short of that ideal is second best. Yet, of the adult males who constituted Athens’ citizen body, only a minority would have been able to meet in assembly and discuss their common affairs. When such mythical images take a grip on one’s thoughts, one is often driven to a view of democracy in which the will of the people will triumph through that people’s direct involvement in decision-making. The myth of the will of the people is thereby established. Albert Weale is the author of The Will of the People: A Modern Myth, published by Polity Press in September 2018, of which this article is an extract.